The advantages of electric bikes are no longer to demonstrate, both to the environment, your health, your wallet. Sensitive to these arguments, are you thinking of buying a VAE, but you knock again a few questions, especially about the principle of operation of this mode of travel. Various points, of course, to take into consideration, and in the first place the location of the electric motor. You have 3 choices, either it is placed in the front wheel, rear wheel or the electric motor will be mounted at the bottom bracket. Each configuration has its advantages but also its disadvantages. In the case of a motor placed in the front wheel, it is especially the concept of prices intervenes. Less complex to install and requiring less design work on the game framework, the engine located in the hub in the front wheel will be perfectly suitable for use on an uneven, relatively flat, because it suffers undeniably in climbs too steep and suffering of skating at the start. Providing the sensation of being pulled forward, he goes fishing in the turns where the extra weight on the front wheel has a tendency to play on her stability at the time of turning the handlebars. Nothing insurmountable of course, but it is important to know at the time of your choice, especially in wet weather or on terrain other than tarmac. 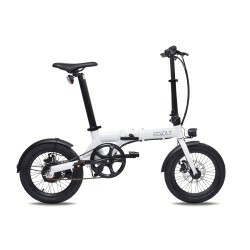 However, if the battery is placed at the rear as on the luggage rack for example, it offers a better distribution of mass, and the integration of a change of speed directly into the rear wheel of type Nexus, NuVinci or Rohloff.